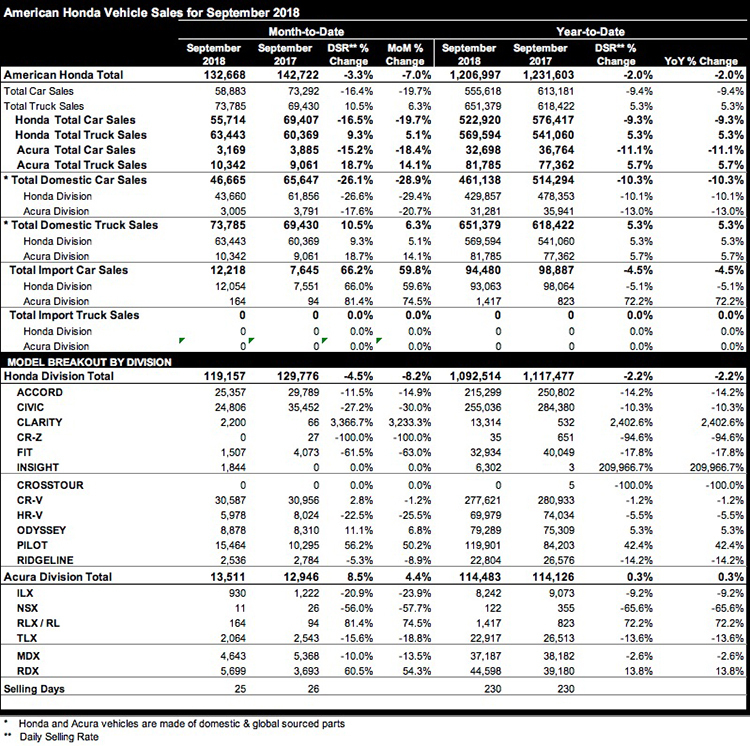 “We enter the final quarter of the year in a very strong position across our passenger car and light-truck lineups, putting us in striking distance of a fourth consecutive year of record sales for the Honda and Acura brands combined,” said Henio Arcangeli Jr., senior vice president of the American Honda Automobile Division. Honda trucks continued to build strong momentum in September, with record total sales and strong performances across the lineup. While car sales ceded some ground to trucks, the strength of Honda passenger cars has pushed them to the top of industry retail market share, despite tight supplies of key models. Honda is the only brand in America to earn an IIHS TOP SAFETY PICKacross car, SUV, minivan and pickup models, including the 2019 Insight. With Accord, Civic and Fit, Honda has topped all other brands in combined retail passenger car sales in the three largest mainstream car segments in the first 8 months of 2018. The new RDX continued to break sales records and combined with strong MDX sales to set a new September record for Acura trucks. RDX set its 4th straight monthly sales mark since launching in June. Sales totaled 5,699 for the month, a gain of 54.3%. Acura’s flagship luxury SUV, the MDX, turned in another strong performance with sales of 4,643 units in September. The refreshed and re-energized 2019 ILX goes on sale later this month. The refreshed 2019 ILX completes the first phase of the Acura brand design transformation with all core models sporting the signature Diamond Pentagon Grille and an A-Spec model.